Moving from SMEs to LMPs: Learning Matter Practitioners. There are countless resources on how to work with subject matter experts (SMEs). How to get the information you need from them. How to get their buy-in. How to negotiate what’s learning content from organized resources. How to help your SMEs understand how instructional designers do our jobs, and why. This battle for cooperation, if not partnership, with SMEs has been well-worn topic for a long time. But in this new world of building learning landscapes and personal knowledge management (PKM) (what I call The Learning Age), we’d be better off if we approach the problem in a new way. 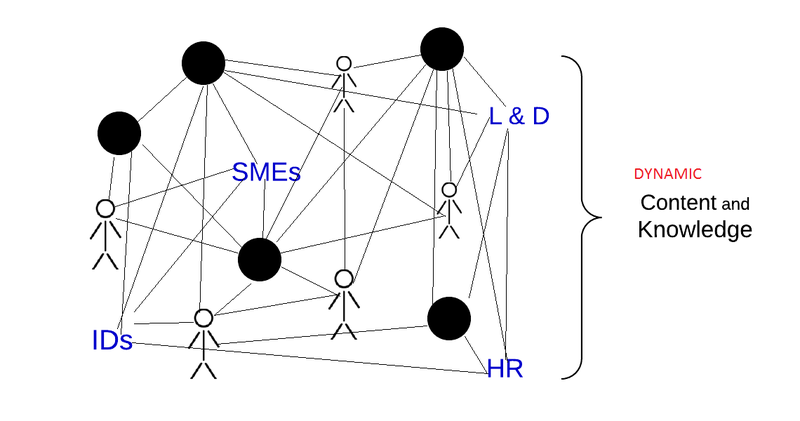 SMEs are just another node in a networked world/workplace that includes data, workers and support systems. Let’s work to integrate their expertise to be available to all. Perhaps instead of wrangling content, divining applicable knowledge from content, and support information from noise, we should spend more time inviting SMEs into the world of networked learning. The days of heading to the mountain top to receive golden nuggets are over. Content is everywhere, information can be found—or at least should be able to be found—easily. Our SME is not the font of content, or knowledge, but of experience. That is, how the knowledge is applied effectively, efficiently, and with 360° understanding of the context. In other words, we need to train our SMEs to become LMPs—learning matter practitioners. Not that they need to be great teachers or steeped in instructional design, but they do need to be taught how to share their work (WOL, work out loud! ), deliver insights in useful, accessible ways, and be available to people across their organization and (perhaps) industry. If SMEs don’t document, share, comment, tweet, blog, and visit with others, then that is an area for learning practitioners to invest time and programming dollars. This may require that most daring of high-wire acts, the change in workplace culture. Spoiler: The change is happening under our feet anyway. Let’s invite even the most siloed SME to join the emerging networked workplace. Some now claim that 81% of workplace learners are responsible for managing their own professional development (PD), and 91% expect technology to enable quicker responses to learning/change conditions. Whatever the actual numbers may be, the trend toward individually initiated PD is clear. Whether SMEs know it or not, or are resistant or not, “traditional” SME status will only be as elevated as their ability to integrate hard-won experience into the dynamic, shape-shifting network of the modern workplace. Now that is a learning challenge for us to dig our hands into. I like working with PDWs (People Doing the Work). SMEs are usually quite happy to turn that part of the design/development process over to someone else. The PDWs are a key part of the design thinking process which I like to use to augment the ADDIE workflow. Thanks for the comment, Urbie. Absolutely PDWs (new term for me) are essential. Sometimes SMEs are the PDWs (that’s best), sometimes not. Depends on the topic and circumstance.